Life is confusing. And hard. Especially explaining it to your children. About how life doesn’t have to be fair. About how most of the time it’s not. And no amount of indignation is going to change that. People make poor choices. Every moment of every day, someone is making a poor choice. A choice that may or may not have any consequences. For them. And yes, I know. You have gotten caught at anything you’ve ever tried. You’re the one who always gets caught and “they” never do. And no amount of indignation is going to change it. It’s like the deputy who sat at the end of our street yesterday. Our DEAD END STREET. And he waited. Turns out he was watching for folks who did not come to a complete stop. At the last stop sign before the last cul-de-sac on a cul-de-sac. Ahem. Slow day in town I guess. (Don’t get me wrong, I’m all about safety, but his three hours at the end of the street seemed a little excessive-we seriously don’t have that many folks in and out around here.) Anyway, there are people who do the California roll every single time at that stop sign and they totally missed getting caught by him yesterday. Maybe they didn’t come home during his hours with us, or maybe they saw him in time. Whatever, they didn’t get in trouble. And then there were others–the mom rushing home to check on something or the dad who came home quickly to meet his daughter’s bus–who might always come to a complete stop, but yesterday, well…..not so much. And they got a warning or a ticket or whatever. They got busted. And the others? Most likely will continue to roll through and maybe nothing will ever come of it. And worrying over it won’t do any of us a bit of good. It just is what it is. I get being angry. I get the frustration. Princess thinks Cooter never gets in trouble for what he does and vice versa. The truth is each one of them gets reprimanded when and where appropriate and repercussions follow. But in the big, outside world, I’ve known folks who seemed charming and delightful but were mean as snakes on the inside and no one ever held them accountable for their actions. Maybe no one ever will. I have to let it go. The eating me up inside only makes me hollow. Doesn’t hurt them one little bit. And that’s why I know I have to stop. So why bother? If it doesn’t even matter, maybe I can get away with it too. Is that what you are thinking? I guess I can understand that. But I’ve been thinking on it and I read something today that made me think on it even more. Amen. If you done it, you done it, and you have to carry that in your heart. It really doesn’t matter if you get caught or not. It has to be let out for you to be able to live and breathe and move on. For you to be whole. So what is life all about? Why bother? Why do the right thing, why make any effort at all if you don’t have a cheering section for all those right things you’ve done in life? Why try if the only time you slip up, there’s suddenly a glaring spotlight on that and no one remembers everything else you did that was right? Eula in “Whistling Past the Graveyard” had an answer for that too. That’s why you do what’s right. Not so you can be noticed. Not because we are afraid of being in trouble or getting caught or what other people will think. Because of that. Because we can. Because we know better. That’s what it’s about. 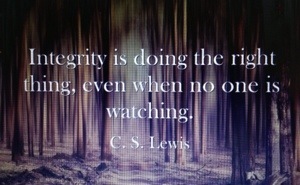 No matter who is or isn’t watching, do what you know is right. And if you aren’t sure, do the best you have with what you have in that moment. It won’t always be easy, but it will always be the thing to do so you can get up and face that mirror day after day, look yourself in the eye and hear the echoes of folks in the past, and know that you have nothing to answer for that you haven’t already. And that is worth more than gold or silver or whatever is the next big thing. That is worth everything.